Underwater Animals - Don't trust them! After several years of working as a scuba diving instructor all over the world I am still passionate about the underwater creatures that keep diving lively. 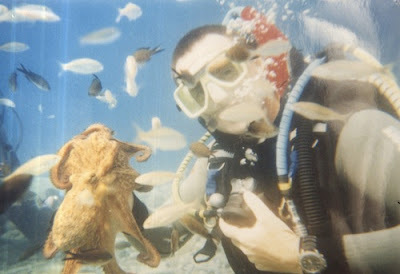 This post is about just a few of the critters I have encountered while diving, sort of a dive instructor’s guide to what really goes on under the waves. Humphead Napolean Wrasse are gentle giants. They can get to the size of a cow and are generally a greeny-blue-ish colour. They tend to have a pronounced forehead (hence the name) and large lips. In some places they have become very famiiar with divers and will approach them. I had exactly this happen whilst leading a dive in Egypt. I counted my divers and the next time I counted them there was an extra one. 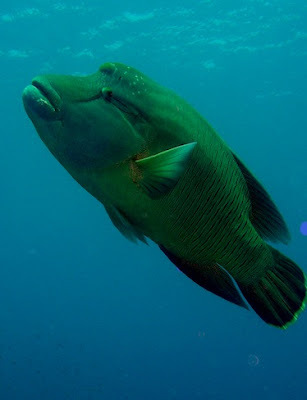 When I scanned the crowd I realized that one was a naughty Humphead Napolean Wrasse who had sneakily joined our dive group. Nurse sharks are funny things too. Unlike stereotypical sharks they are bottom dwellers and barely have teeth. Instead they use their powerful jaws to crush their prey. Whilst feeding sharks in the Bahamas a nurse shark often turned up and suckered himself onto the bait box, making manouvering it extra awkward. Everyone has a bad day, but despite their happy, friendly “Nemo” image, Anemonefish, in my experience, have all been rather grumpy. They are very territorial about their anemones and should you get too close they will charge you, often knocking into your mask. Since their lower lip juts above their upper lip, they wear a permanently frowning expression too. Sargeant fish lurk all over the wrecks of Barbados. For such a small fish they have an awful attitude too and are not good at sharing space. Many a time whilst exploring the wrecks of Barbados I have noticed what feels like another diver knocking my fins. What it turned out to be each and every time was sargeant fish charging my ins and biting them. They are small fish and have never bitten my skin, but for some reason have it in for fins. Octopus are very cunning creatures. They can conceal themselves excellently and once they think they have a grip on something they want they do not let go. I used to introduce students to an octopus who fairly reliably stayed in one spot in Turkey and sometimes getting his suckers off the students was quite a job. As a dive instructor I embrace my duty to protect and showcase the underwater environment. I love being underwater and I am passionate about all the fascinating creatures that live in our oceans so showing it off to divers is easy. OR at least it is mostly easy when the marine life does its stuff. After a thorough, reassuring dive brief to some first-time night divers in Egypt we entered the water, each with torch in hand and keen to see the busy evening reef activities. It seemed quiet. The students were fine. I looked around thinking the fish must be around the next coral head. We swam around for the quietest 40 minutes of my underwater life and barely saw half a dozen fish. It was really quite embarrassing. OF course the students pulled me up on there being so little to be scared about diving at night. Luckily they found it funny. Have you had any freak encounters with wildlife of any kind?